Since Thanksgiving will be observed later this week, it might be good to consider the fundamentals of Scripture that influenced the thoughts of the Pilgrims. This persecuted group of believers used the principles of the bible as a guide for their lives. When they read the 10 Commandments, they believed they were exactly that—commandments and not suggestions. The moral argument is based on the concept of objective moral standards: Absolute right and wrong exist, and we know this internally. Does a child need the 10 Commandments to know it is wrong to steal.? No, he knows this before he can ever read and cries loudly when he senses he has been wronged. What about murder? We don’t need to be taught that murder is wrong, and we don’t need to read the 10 Commandments to know it is wrong; we intuitively know that it is wrong. The 10 Commandments simply reinforce, in a profound manner, the moral imperatives that we instinctively know to be true. Those who object to the concept of the moral argument might question: “If morality is absolute, why do we see so much evil in the world?” To label certain actions as “evil” is to imply the existence of objective moral standards. If there is no moral standard, how can anything be good or evil? The Pilgrims experienced religion at its worst and suffered in their quest for freedom to worship without the interference of the government. Because they had the audacity to possess an English bible, read it, and teach it, some of them were burned and others were imprisoned. It was this sort of corrupted religion that was the motivator for John Bunyan to write Pilgrim’s Progress. To state it more simply, the moral argument is the realization that there is something in us that insists on right action for the benefit of self and the betterment of all living things. When the Pilgrims insisted on right action, they were persecuted. To escape the heavy hand of the Church of England, they eventually made their way to the shores of a new land where they worshipped the God of the bible. For this, I give thanks . . . When I reach this point on the calendar each year, my thoughts turn towards Thanksgiving. I must confess that I think of turkey, candied sweet potatoes, and pie. More accurately I should say pies—cherry, pecan, and apple. I think about more than just food. I also think of the sacrifices of our Forefathers. Daniel Webster commended the sacrifices of the faith-filled and hardy Pilgrims when he said: Our fathers were brought here by their high veneration for the Christian religion. They journeyed by its light, and labored in its hope. They sought to incorporate its principles with the elements of their society, and to diffuse its influence though all their institutions, civil, political, or literary. 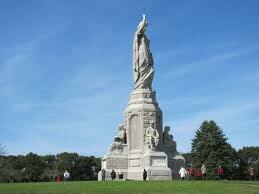 The sacrifices of our Forefathers are memorialized in the Forefathers Monument. This monument is the largest granite structure of its kind in America. It stands an imposing 86 feet high and weighs 180 tons. It is appropriate that at the center of the monument onlookers see a classically draped female entitled Faith. Her right hand is lifted towards heaven and her left hand holds the Bible of the Pilgrims, the Geneva Bible. She stands 36 feet tall, and she is posed with one foot on Plymouth Rock. Lady faith reminds us of the faith of our Forefathers. Their faith was the source of their strength as they struggled to embrace the liberties and freedoms they envisioned. Their faith sustained them and guided through times of heartaches and trials. Let me share another quote from Daniel Webster: Let us develop the resources of our land, call forth our powers, build up its institutions, promote all its great interests, and see whether we also, in our day and generation, may not perform something worthy to be remembered. When Webster spoke of his day and his generation, I think he was comparing it to what the Forefathers had done. I wonder: How does the commitment of our present generation look in comparison? When you give thanks on Thanksgiving, remember to thank God for the generation of our Forefathers. I received my copy of Propositions in the mail today, and the title caught my attention: What’s Missing From Our Middle Class Debate? The author, Barbara Dafoe Whitehead, has a long list of credentials, including her 9 year stint as co-director of Rutger’s National Marriage Project. In her discussion of the dwindling middle class, Whitehead cites a recent study by the Pew Research Center. The data from this study suggests that a decline in marriage is directly correlated to the decline in the middle class. Whitehead concludes her essay with two questions that are worthy of our consideration: (1) Can we realistically hope to rebuild the middle class while accepting the continuing decline of marriage, the very institution on which our middle class most clearly depends? (2) Can we Americans realistically hope for a middle class majority if we no longer hope and strive for a married majority? I have always believed that the family is the load-bearing pillar of American society. As such, we should give some contemplation as to what we can do to strengthen it.